If forced to pick my favorite upcoming game that I saw at PAX East this year, it would probably be the beat’em up Combo Crew from Squids and Squids Wild West developer, The Game Bakers. If you are anything like me, then you probably spent hours in front of your television (sometimes alone, sometimes with friends) enjoying games like Street Fighter, Double Dragon and Final Fight. Tirelessly fighting off wave after wave of enemies with creative boss battles along the way to test your endurance and skill. These are some of my most vivid console gaming memories of my childhood. Sure, there have been a number of iOS fighting games that have tried to recreate this magic for smartphones and tablets, but lets face it, nearly all have suffered from the reliance on a mass of virtual buttons and sticks that clutter and block the screen and deliver a less than fun experience. 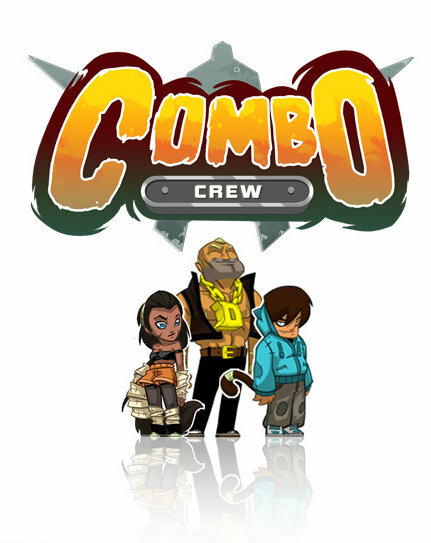 Combo Crew changes all that with its gesture-based approach that both refines and redefines the beat’em up genre on mobile platforms. Doing away with clunky screen blocking virtual d-pads and buttons, and instead opting for a more elegant and iOS device friendly series of taps, and swipes, the game simplifies and streamlines the experience, resulting in a much more fluid and natural feeling game. We had a chance to sit down with the The Game Bakers’ Chief Creative Officer, Emeric Thoa and he took us through a build of the game. Despite having just flown into Boston from France the day before, Thoa’s exuberance and excitement about Combo Crew was infectious. It was easy to see that this is a project that he is very passionate about and proud of and that a genre that he held dear, was finally being treated with the respect that it deserved on (button-less) mobile platforms. In Combo Crew, a trio of heroes face off against hordes of enemies, fighting their way to the top of the tower where they’re being held hostage. When one hero falls, another can take over to climb the floors and advance the crew toward freedom. 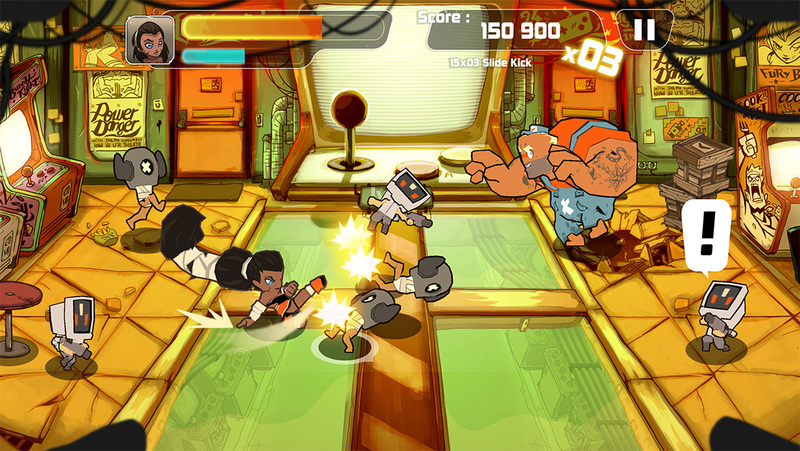 Inspired by the best of the arcade-era brawlers, Combo Crew puts a modern spin on classic beat’em up gameplay with quick play sessions, solo and co-op game modes, a tower level structure, and an “endless” mode. At your disposal are a basic set of moves in which you swipe to attack or swipe back and hold to charge a more powerful hit. You can also tap to block and you can map your four ‘combo streaks’ (from a catalog of martial arts moves based on your chosen character) to two-finger swipe up, down, left and right gestures. In my short time with the game, this felt very natural and allowed for some satisfying combos. By stringing moves together you build up a super combo meter. Landing combinations of attacks increases your multiplier and using a variety of moves is rewarded by charging your super combo meter more quickly. This encourages players to experiment and not rely on the same moves over and over and over again (a common trap for many gamers in this genre). When your super combo meter is full, you then have the ability to trigger special moves, leading to some massive scores and higher rankings on the global leaderboards. One of the coolest features, which I unfortunately did not get to see demoed is Combo Crew’s rather unique asynchronous gameplay. Most gamers will agree that a key aspect of any good traditional beat’em up is the sense of camaraderie built up between co-op players and the ability to come in and ‘rescue your buddy’. It was a little unclear exactly how it’ll work, but somehow The Game Bakers hope to recreate this feeling by allowing you to tag in a (remote) friend to come in and fight for you when you are close to expiring. Playing locally, all the damage that friend does, gets added to your health meter the next time you play, allowing you to continue trying to progress up the tower to the eventual boss. Sounds like a fun new twist and I have no problem trading real-time multiplayer for this asynchronous gameplay implementation, as in my own personal experience, unless playing locally, most real-time on-line multiplayer action games on iOS have been buggy at best and depressingly full of lag. I for one am glad to see The Game Bakers trying something new and I’m fairly certain that thus feature will work cross-platform as well. Though perhaps not immediately apparent in the gameplay video below, the graphics on the game look great, with plenty of polish and there are lots of nice little touches. One neat thing was the way the in-game achievements are represented by (fake) classic console cartridges that look like those used in the Sega Master System, NES, SNES etc. The game is scheduled for a Spring release (most likely sometime next month) and will be coming to both iOS and Android. I am super excited for this one and will be counting down the days until I can play it again. Don’t want to wait a month to play? The Game Bakers Are Looking For Some Combo Crew Beta Testers. It seems that they have received a lot of responses from French speakers willing to beta test their game (not much of a surprise given that the studio is based in France), however The Game Bakers really need some English-speaking beta testers as well.